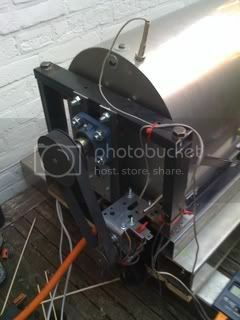 So, here's some more info on the roaster I'm building. My other roaster (see some old thread somewhere on this forum) project has been abandoned since it had too many flaws. The schematics drawing is not very detailed but gives the general idea. The upper frame with the drum and housing is going to be hinged on the bottom frame which contains the heat source. This means I can tilt the entire upper part to dump the beans in the cooler (not included in the schematics) when the roast is done. The other pic shows a couple of the parts which are ready for assembling. 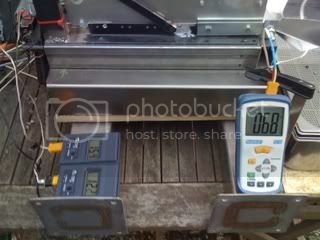 The heat source in the photo is for testing only. The final heat source has a safety system to shut down the gas when there's no fire present and it also includes a thermostat to control the heat. It is much more work to fit it in the roaster though so that's why I am using a different one for testing. I will fit a digital thermometer which uses a probe inside the drum to be able to check bean mass temp. There is no chaff collector in the roaster since it is meant for outdoor use anyway. 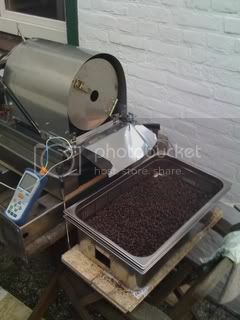 Will you add a meter to check the pressure of gas supplied to the roaster? It might be easier to produce the similar result in later roasts. I mean, at different periods you can mark the amount of gas required for a certain effect. Unless the weather changes drastically, or else the readings should be the same. After spending the afternoon with some metal, a grinding machine and my trustworthy welding machine I managed to get some more work done on the roaster. The hinges aren't fitted yet so the top portion is not attached to the bottom frame. Great to see you back Joris! An impressive machine you've built there too. I guess you have a couple less suits of armour now? Maybe a homeroast/BBQ meet when it's up and running ? What kind of bearing are you using to support the drum? Heat resistant ballbearing in solid metal housing. Axis has contraweight equal to the drumweight. is the top piece the chest plate from one of the famous suits of armour ?? Well, it is finaly finished, it was finished before but there were a couple of things I redesigned. The contra weight for the drum on the axis had to go, it made the top part too heavy. I have created rollers at the front of the housing to support the drum (very high heat resistant wheels and ballbearings). The drum is driven by an 75 rpm motor which I reduced to 37.5 rpm by using 14/28 gears. Added K type temperature probes (one underneath drum, one above drum and one in the drum). After a couple of tests I removed the one above the drum since I can't see the usefullness of it. The burner had to be replaced, the one in the pics above was too weak. With 1 kg greens and an ambient temp of -2 Celcius it took me 23 minutes to reach 1th and another 7 to reach pos 2nd with burner full on all the time. Strange enough the coffee was still quite nice (no baked taste). 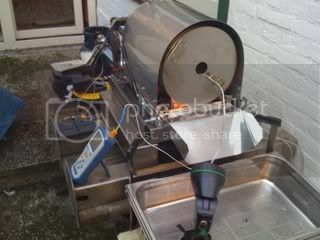 Today I installed a burner which should deliver 5000 Watt which should be sufficient. Tomorrow I'll try a couple of roasts with the new burner in place.